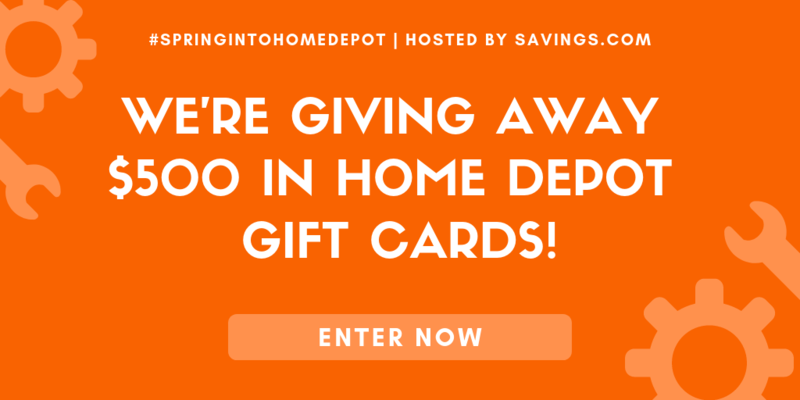 This is a project of The Women Bloggers and Kendal King Group on behalf of our client. 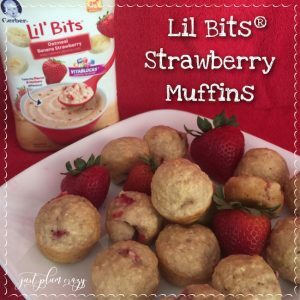 Lil’ Bits® Strawberry Muffins Recipe! 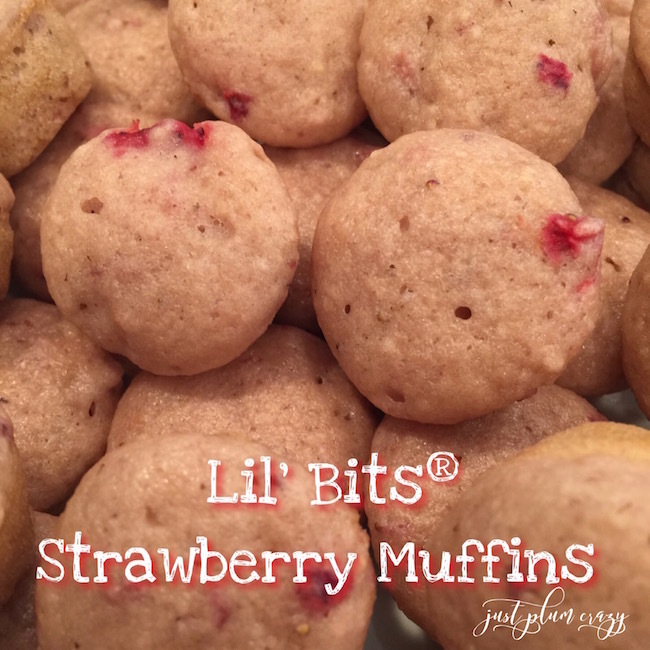 Lil’ Bits® Strawberry Muffins are made with secret ingredients. But they are all good ingredients. There is nothing more disheartening than not seeing your kids eat. 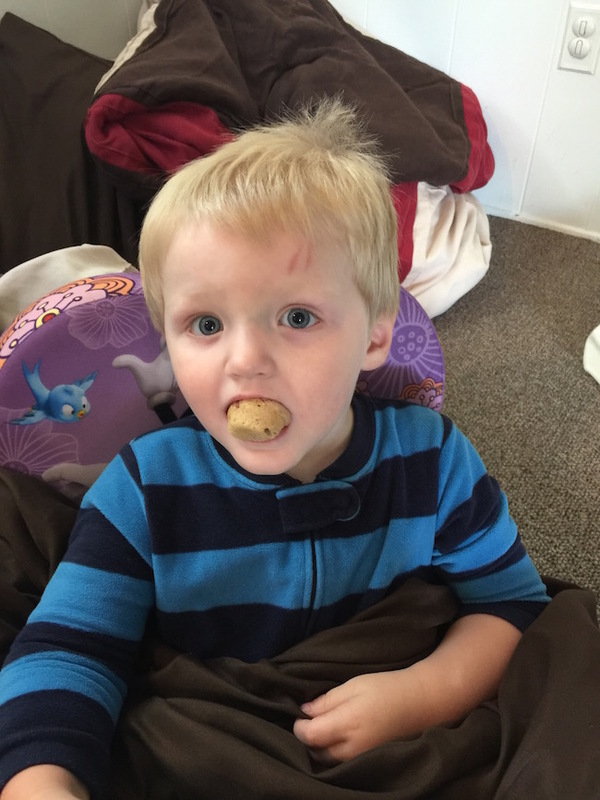 We have two very picky eaters and there are days that I wonder how they survive without eating…anything! Sweets never seem to be a problem for them, but it’s a problem for me. I don’t want them eating junk food all the time and not getting the nutrients they need. 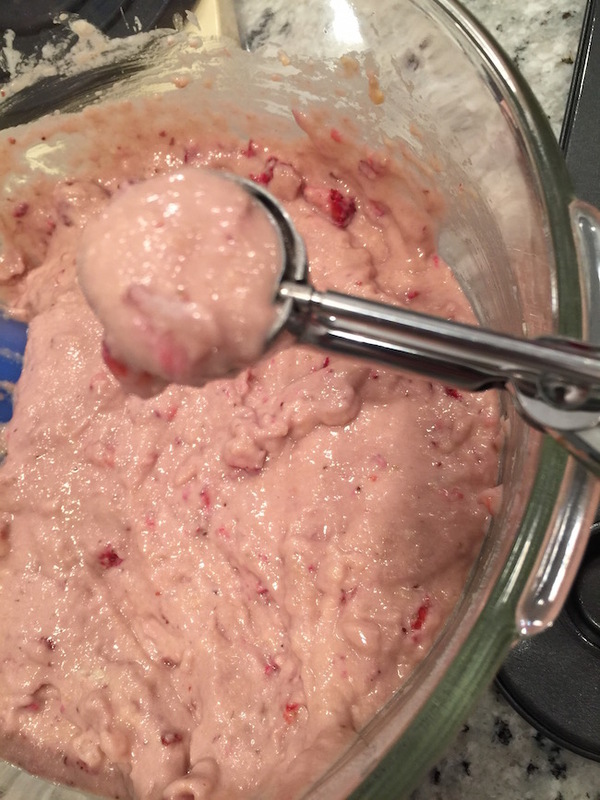 So I came up with a recipe using leftover Gerber Lil’ Bits® Banana Strawberry Oatmeal, Gerber Apples or Apple, Strawberry, Banana Blend, and Gerber Mixed Berries Yogurt. 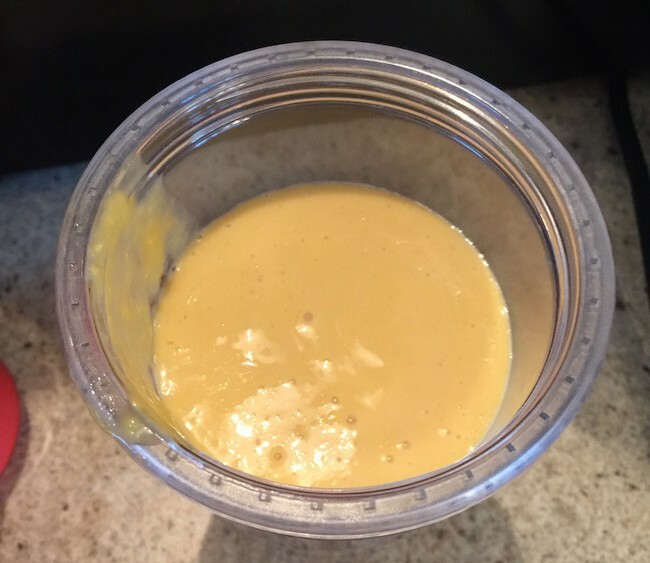 This is the perfect healthy choice recipe if you were wondering what to do with all your leftover baby food. They take pride in using only high quality ingredients that meet rigorous Nestlé® standards. They are loaded with Vitablocks Blend of 6 B vitamins, vitamins C and E, zinc, calcium and Iron which is the key to healthy growth and development. 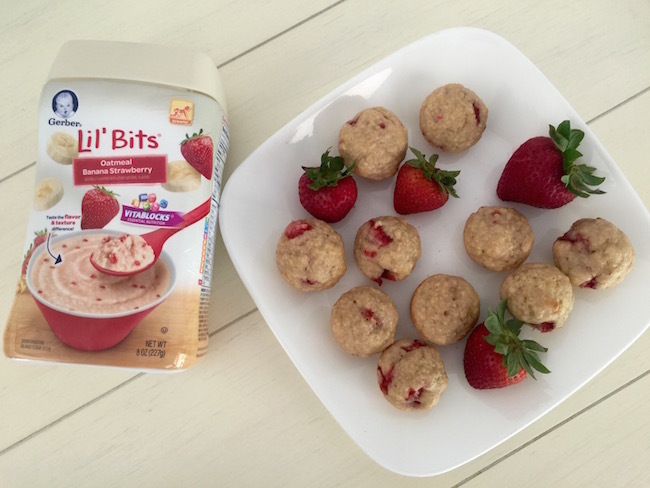 1/2 cup of Gerber Lil’ Bits® Banana Strawberry Oatmeal. 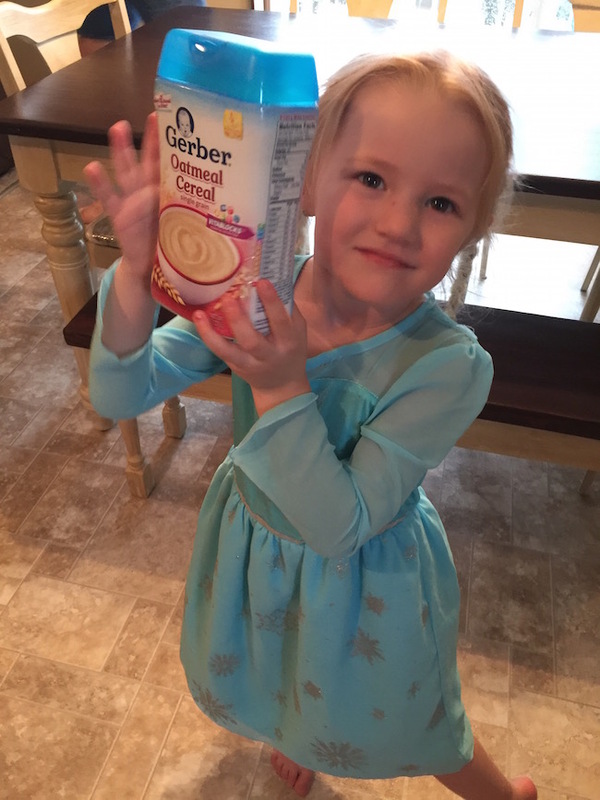 1 container of Gerber Mixed Berries Yogurt Blends or Strawberry Banana Yogurt Blends. 1 Container of Gerber Apples or Apple, Strawberry, Banana Blend. 1 tsp. Vanilla Extract. (this is optional although I thought it gave it loads of flavor. 1 cup diced fresh strawberries. Mix all dry ingredients together; Gerber Lil’ Bits® Banana Strawberry Oatmeal, flour, sugar, baking powder, and salt. 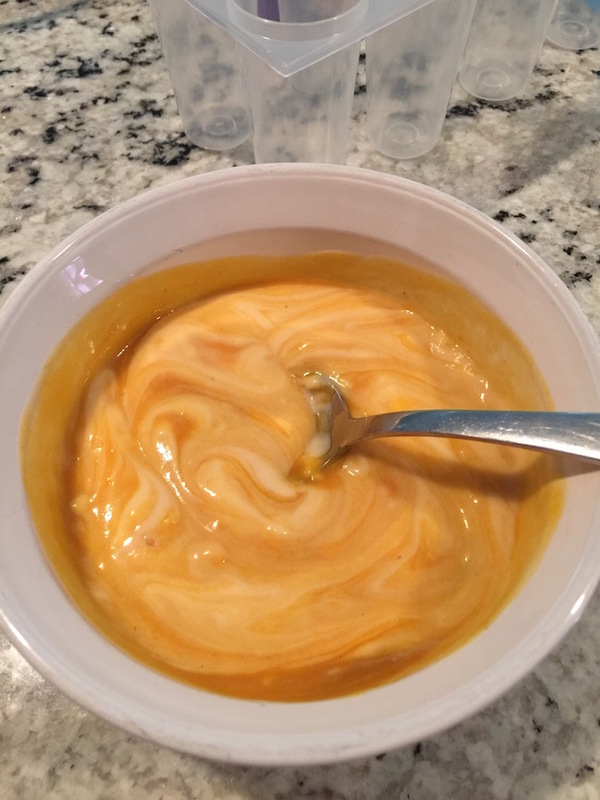 Add eggs, vanilla and strawberry extracts, Gerber Yogurt Blends, and Gerber Apples. 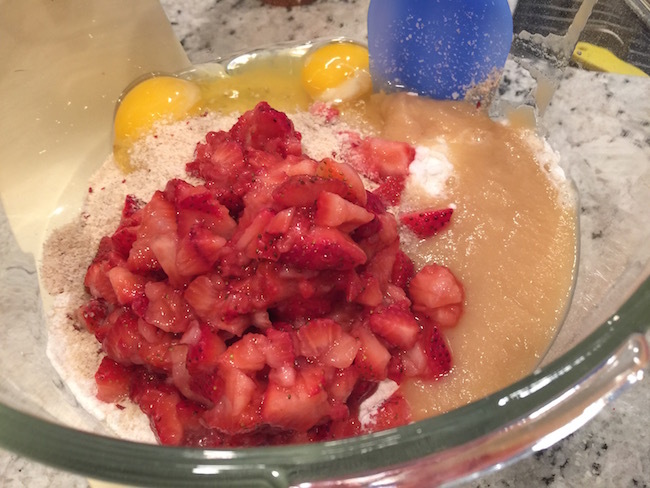 Once mixed, fold in fresh diced strawberries. 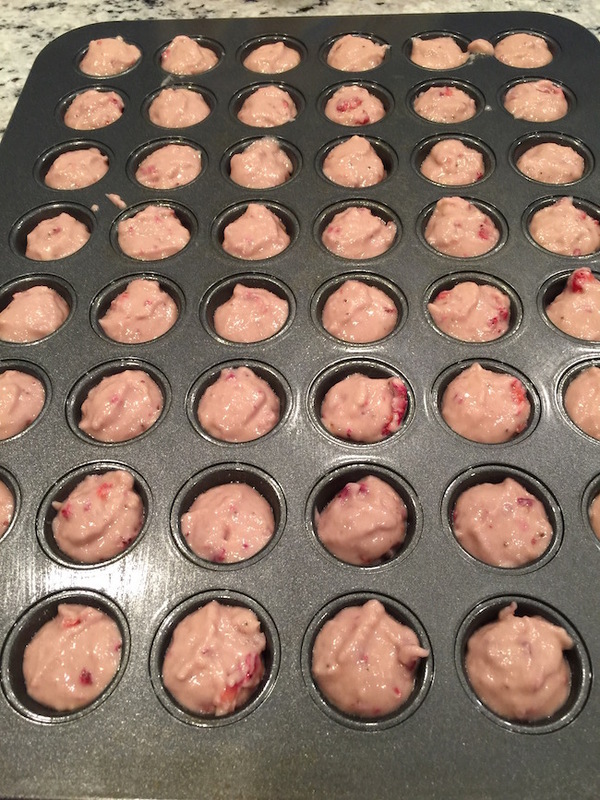 With small scooper, scoop into sprayed muffin pan. I tried using muffin liners, however, I found that half the muffin stuck to it. It works better in a sprayed muffin pan. Bake at 350° for approximately 10 minutes or until golden brown. 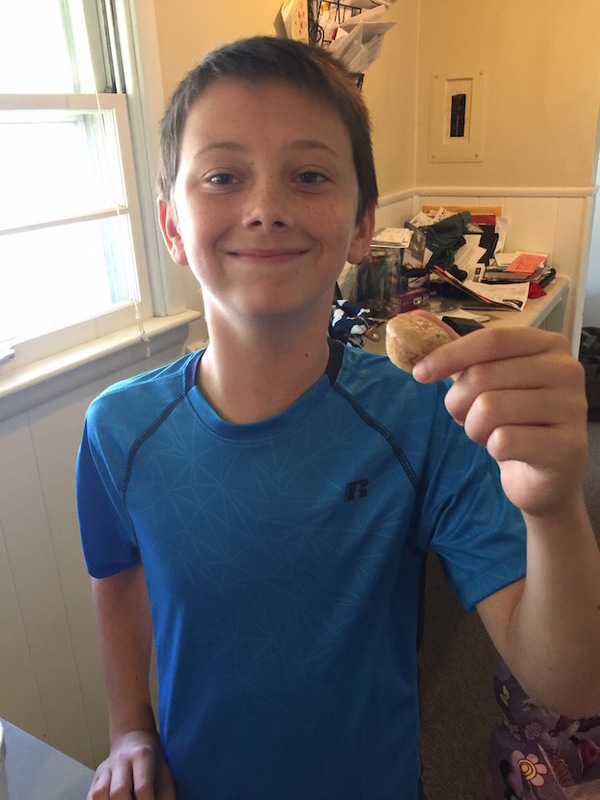 Test center with a toothpick. This recipe makes about 72 mini muffins. 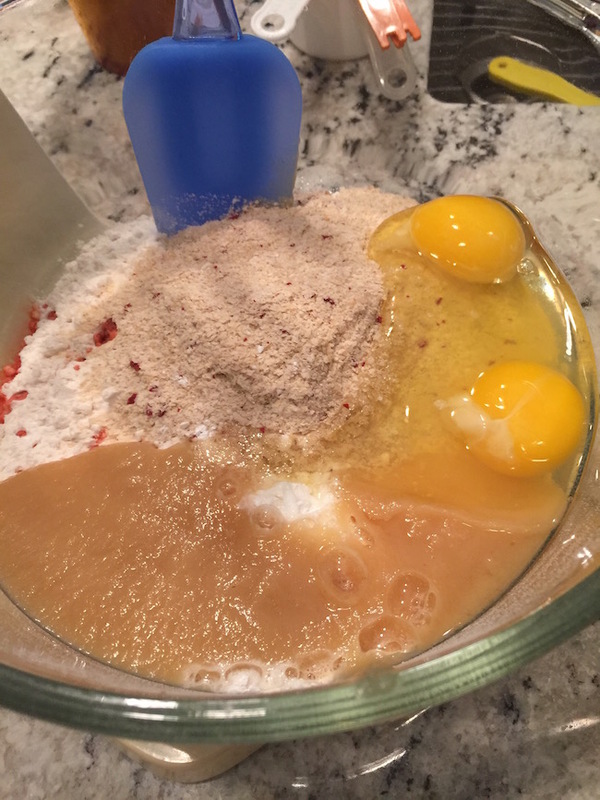 I know you are thinking that’s a lot of muffins, but they go quickly….very quickly! Yeah, they are that good! And they are very moist because of the addition of the apples and yogurt. Young or old everybody loves them (including me!). These are great for road trips, playdates, swim days, or anytime snacks. 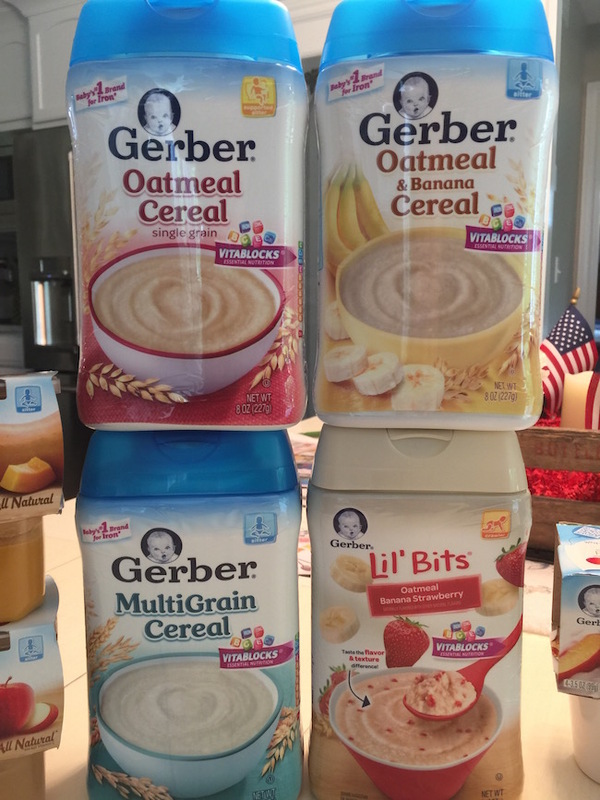 The Gerber Lil’ Bits® Strawberry Banana Oatmeal isn’t the only option available. They also have Oatmeal and Banana Cereal, Multigrain Cereal and regular Oatmeal. 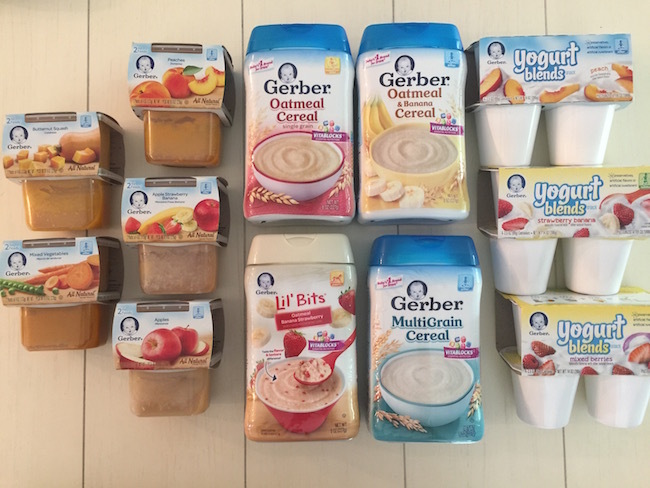 Single-grain/Multigrain options allow babies to naturally progress from breastfeeding to solid “real food” by moving from Gerber® single-grain cereals to multigrain cereals and then on to cereals with fruit, Lil Bits® and Hearty Bits. 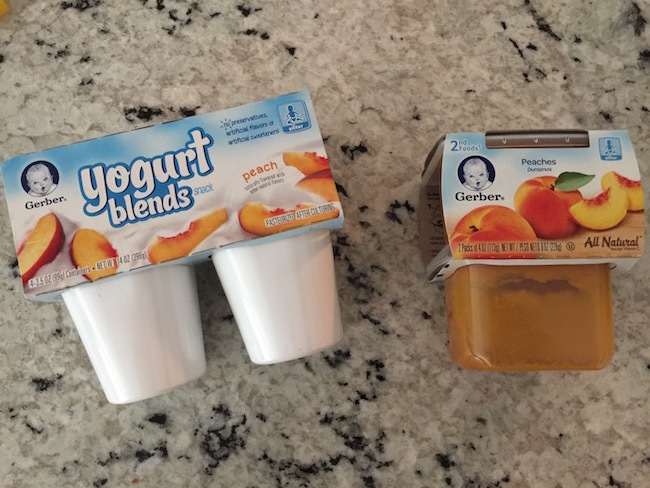 When the babies stop eating baby food, you can be left with a lot of leftovers. Rather than throw them out, there are a bunch of other things you can do with them besides this recipe. Be sure to check out the other Gerber recipes by searching the hashtag #CookingWithGerber. They are a great recipe substitute when you are looking to add flavor. 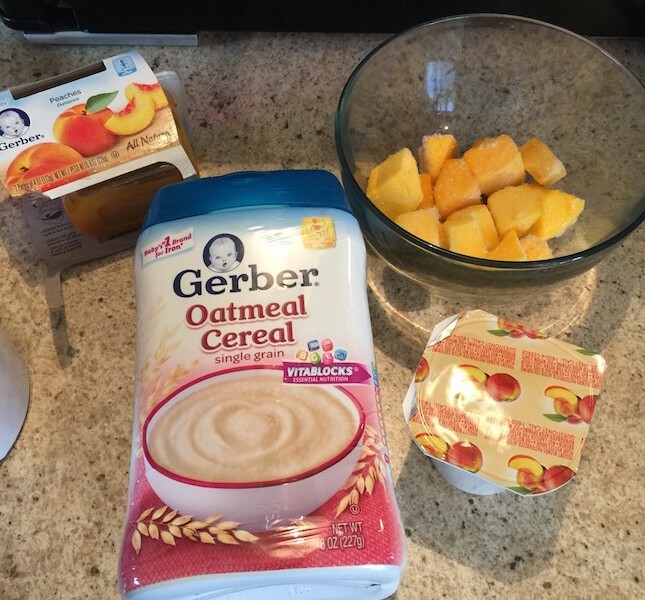 I also made a Peach Smoothie with 1/2 cup of Gerber Oatmeal Cereal, 1 container Peach Yogurt Blends, 1/2 cup frozen diced peaches, 1 container of Gerber Peaches and 1/2 cup of milk. Blend well and serve. How about some frozen pops? 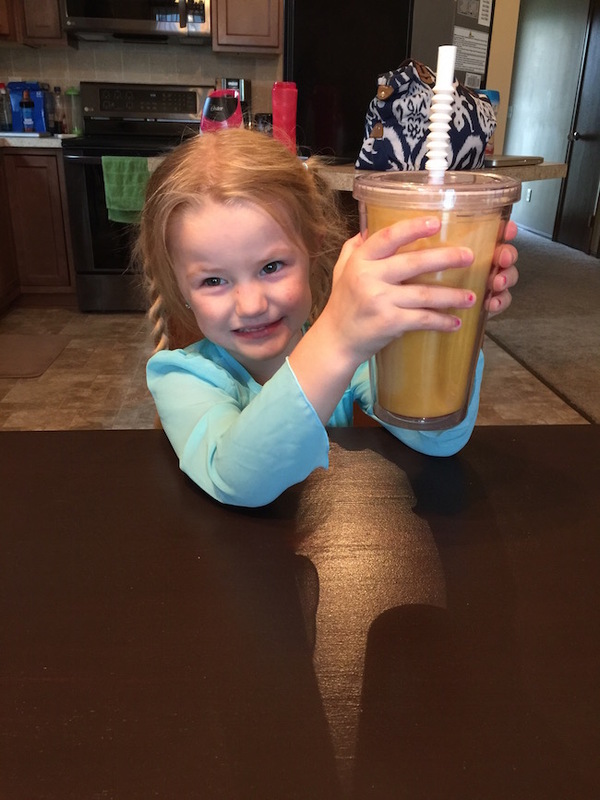 Made with 1 container of Gerber Peach Yogurt Blends and 1 container of Gerber Peaches. 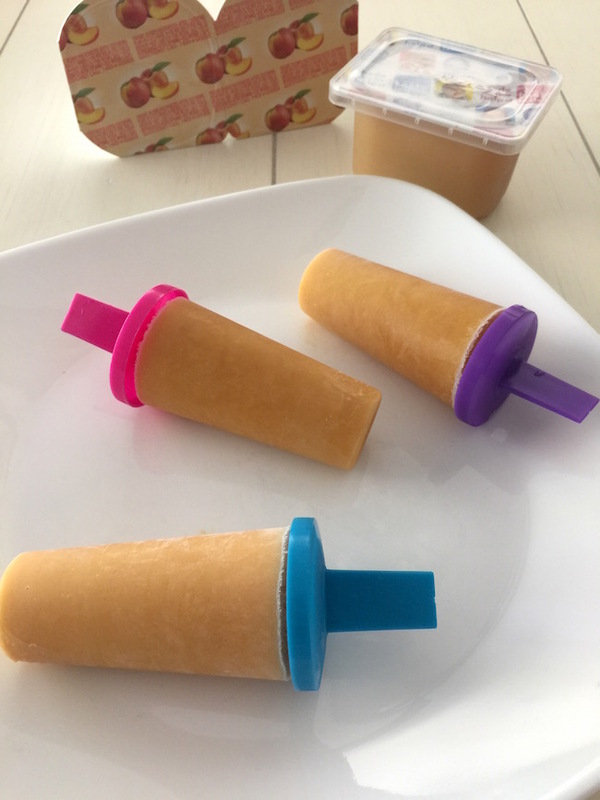 Mix well and pour into popsicle container, freeze and enjoy! Gerber® believes that breastfeeding provides the best possible start for babies. They offer prenatal guidance and products. Strict standards of food safety, quality, and regulatory standards for our products, ingredients, and packaging. 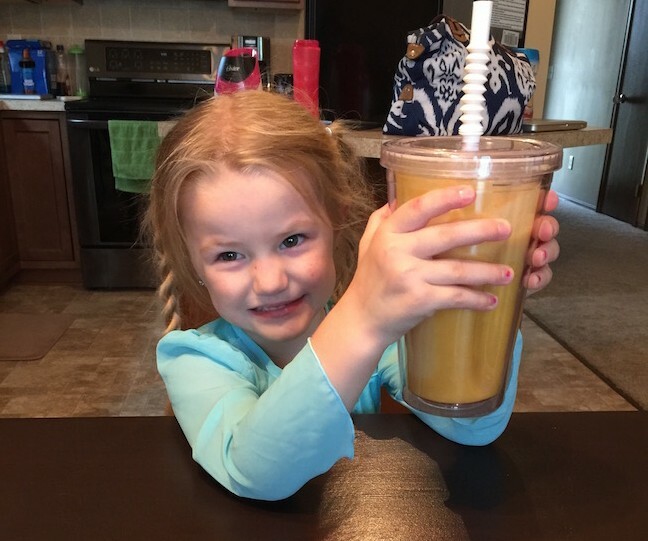 Select only healthy ingredients and ensure developmental appropriateness. 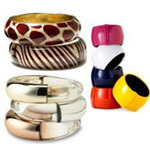 They conduct rigorous research to ensure high-quality products. But, just in case you don’t have any leftover Gerber baby cereal on hand, and you want the kids to eat something nutritious and good for them, they are readily available at Walmart. 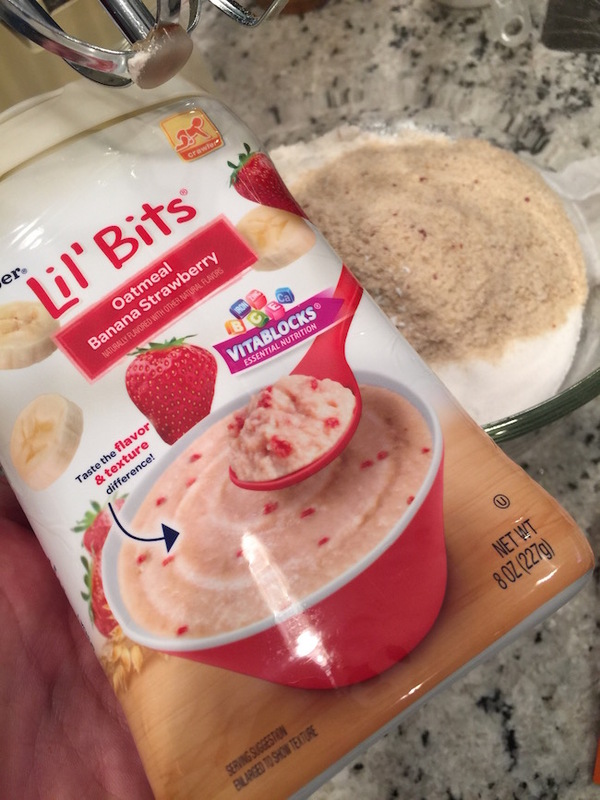 1/2 cup of Gerber Lil' Bits® Banana Strawberry Oatmeal. 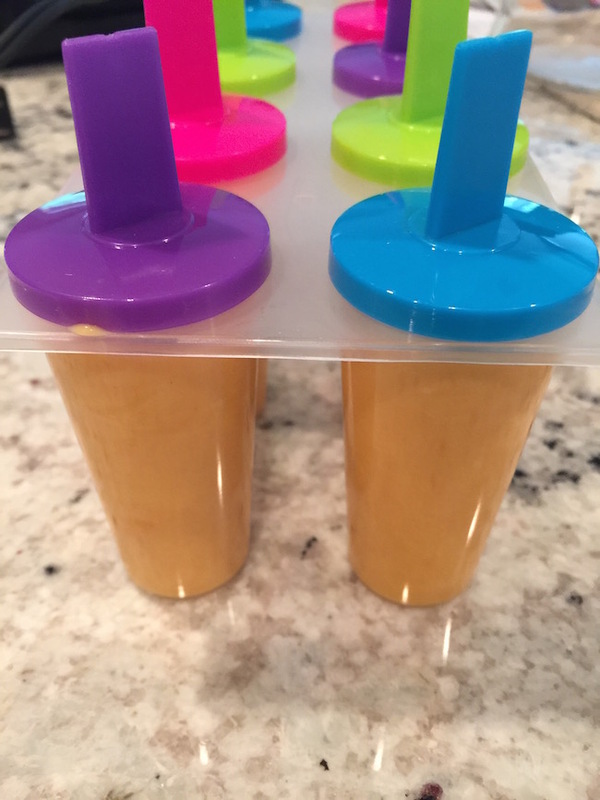 1 Container of Gerber Apples or Apple Strawberry, Banana Blend. 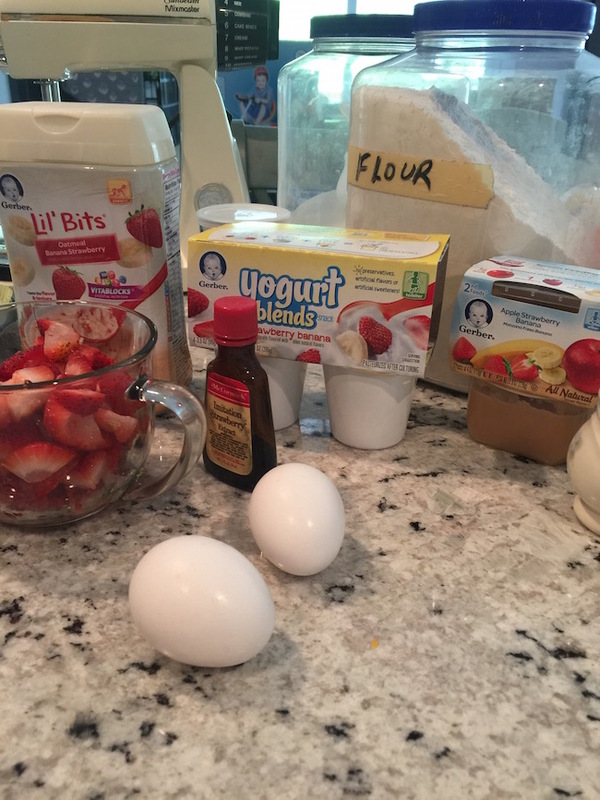 Mix all dry ingredients together; Gerber Lil' Bits® Banana Strawberry Oatmeal, flour, sugar, baking powder, and salt. 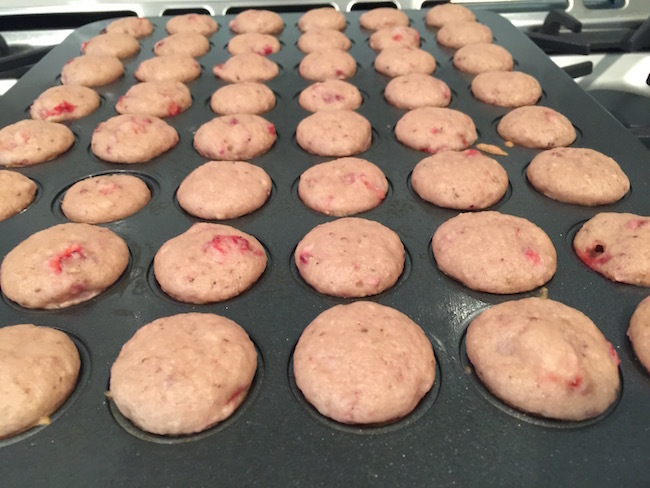 This recipe makes about 72 mini muffins.